So there I was this morning, waltzing through Boots, humming Deck the Halls with Boughs of Holly under my breath and trying to work out where I might have put the shopping list I had carefully prepared before leaving home. Suddenly, in front of me, a Face I Recognised. "You are allowed to smile, you know!" she admonished me, before going on to describe, in detail, the look on my face which, in her opinion, was apparently not at all festive. I mean, how would you have reacted? AIBU (as they always ask on Mumsnet, or Gransnet, or presumably any other net you care to mention) to feel a trifle upset? Some people are blessed with smiley faces, so that they look cheerful even when they are not smiling. They are the lucky ones. Then there are people with faces like mine. It wasn't only me: a similar thing happened to the driver of the Pulse bus which had taken me (one of only six customers, I couldn't believe it) into town. He was, I thought, a cheery soul, in that he was wearing a Christmas jumper - but this didn't appease the passenger who boarded the bus at the Goring Road stop, enquiring of him whether he was going into town. "Where else would I be going?" he asked her, jokingly. Which wasn't the silly answer you might have thought it because the route of the Pulse is plastered all over the bus in glorious technicolour. "Somebody's grumpy today!" remarked the passenger, as she took her seat, in a loud and tetchy voice so that everyone on the bus could hear. I am willing to bet that poor driver wondered why he'd bothered to don that jumper featuring a fat Santa trying to squeeze down a narrow chimney. There are few things worse at Christmas than being thought to be a Grinch. Well, actually, that's a ridiculous thing to say because there are lots of things that are worse, like being homeless, being lonely, not having enough to eat. I am, indeed, one of the lucky ones. Especially as I know I'm not feeling grouchy, whatever the look on my face. Mrs Positive Thinking, that's me. Oh, yes, it is! Our Christmas will be all about family. We will spend Christmas Day tomorrow with the Eldest of the Darling Daughters and her lovely family, sharing all the family traditions they have developed over the years. My sweet Swift Girls are Big on Tradition. Mr B and I will be royally looked after. Then each day over the next three days a different family will arrive at our house to help us celebrate Christmas 2016. Boxing Day we will welcome Team Baldwin. We will have a reasonably grown-up (and hopefully delicious) Boxing Day meal, before getting out the games and embarking on a major family tournament which will reduce all the grown-ups to children as we squabble (more or less) amiably over who is winning and who is losing. We will play The Game of Life, making up outlandish names for our spouses and children, and all aiming for a career as a Superstar as we seek to make it to Millionaire's Mansion by the end of the game. The following day we will descend into Magic and Mayhem when The Rascal and The Twinkles arrive. What fun! We will spend much of the day protecting the Christmas tree from a Twinkle Invasion and finish the day in the bath-tub where much water will be dispersed from bath tub to bathroom floor. There will be much ripping of wrapping paper, much singing of songs, combined with hugs and kisses. Finally my (Not So Very Little) Welsh Boys will breeze in for their Second Christmas. We will have stockings, Guess the Bird Song crackers, a trip to the circus. There may well be a seasonal play to be enacted, scripted by Sam the Storyteller. Young Morgan, aka The Duracell Bunny, will share my bedroom so that we can have deep and meaningful conversations each morning about love, life and the Occasional Unfairness of Being the Youngest in the Family. So am I ready for all this? I hear you ask. My ambiguous answer has to be: as ready as I will ever be. That's the thing about Christmas preparations - there is always more you could do. In the end you just have to decide that enough is enough. 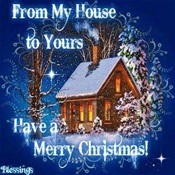 Tonight I will be going to Midnight Mass with my lovely friends Sue and John. We will fortify ourselves with a glass of sherry at their place before venturing out into the chill to join the congregation in beautiful St Andrew's Church. For me, that's when Christmas will truly begin. How and when will your Christmas begin? However, and whenever, I hope you will all have the happiest Christmas, full of love and laughter.